Here’s a fun little self-test for you. 1. Have you finished a mix in the last 30 days? 2. If I was thinking about hiring you to mix my next album, could you send me a link to an online portfolio where I can hear some of your latest mixes? 3. Do you schedule regular time to work on music in your studio? 4. Are you happy with the way your mixes are sounding right now? 5. Are you confident in your ability to take on a mixing project and make it sound incredible? If you answered yes to all five questions, you rock. Keep doing what you’re doing. If your answer to any of the questions was “no,” then you’ve got some work to do. Here’s my suggestion – look at this list of questions as a to-do list. If you answered “no” to any of them, then make it your goal to change those answers over the next 30 days. You’ll be happier (and your mixes will be better) because of it. 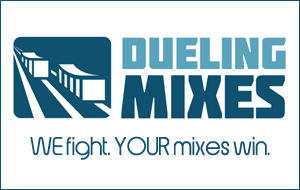 There are plenty of ways to approach this, but in my terribly biased opinion, I think Dueling Mixes is one of the best options for you.